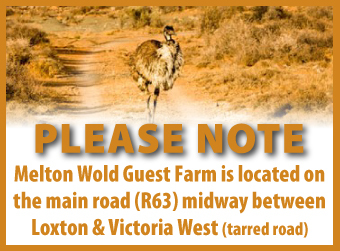 Melton Wold is a working sheep and game farm located between Victoria West and Loxton in the Northern Cape, South Africa. 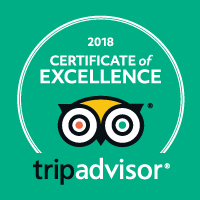 It is also the home of the Melton Wold Guest House. GPS coordinates of the airfield are 31deg 29min south & 22deg 45min east. Airfield altitude is 1 321m / 4 334ft above sea level. The Airstrip is 1km in length and approximately 15m wide. The landing strip heading is approximately 03 / 21. Our landing strip surface is firm gravel/sand, and is graded on a regular basis. A yellow wind sock is located 100m to the east of the landing strip. There is no lighting at the airfield but if necessary lights from farm vehicles can be arranged. Parking area available on the northern end of the landing strip. Currently Melton Wold does not supply aviation fuel. The closest supply of aviation fuel is at the Beaufort West Airport, with the closest alternate landing strip to Melton Wold been Victoria West, approximately 40km east of Melton Wold.